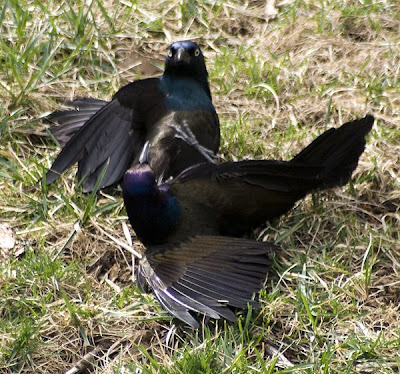 Have you started seeing common Grackles where you live? The past three days, our backyard has been inudated with them. At first, I thought it was pretty neat, but after dozens started eating the our seed, and tearing up the yard, and surely freaking out our densely populated suburban neighborhood, I'm starting to think I might have created a nightmare. I don't mind a few grackles, but hundreds is a different thing. I'm speculating that the flocks that have come to our yard are migrating north? Today, for instance, they seemed to have moved on. 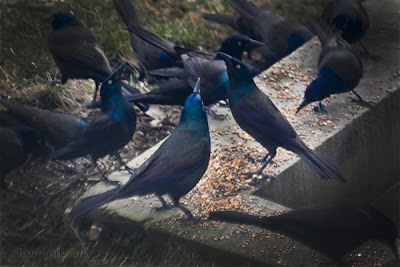 When I first saw all these grackles feeding, I got a few blurry shots through our downstairs window. To get some better shots, I bolted up the steps and into our small master bathroom, newly painted green, to open up the window to get some clear shots. Unfortunately, as I slid the creaking window open, I scared the birds away. Except for two, that literally dropped out of the old bur oak and onto the ground, seemingly locked together by the feet. Battling with each other, pecking at each other, I wasn't quite sure what they were doing, how they were attached, or how long this scrum would last. The birds quickly wiggled across the ground, fighting all the way, until they went just out of view behind the big oak. Has anyone seen anything like this? Also- around mid-day, I added another camera critters post at Tom Arbour Photography, an Image of Sulphur Crested Cockatoos from Australia. How funny! 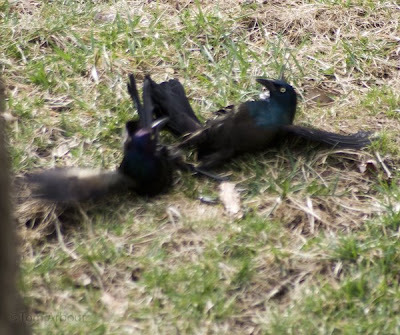 I haven't seen grackles fight, but I have seen other birds fight and my boss,Chris, witnessed a male Baltimore Oriole chase down and kill another male last spring. I don't think I want to mess with those birds. I would be outnumbered & I think I would lose that battle...no fun chasing something that is going to chase you back! 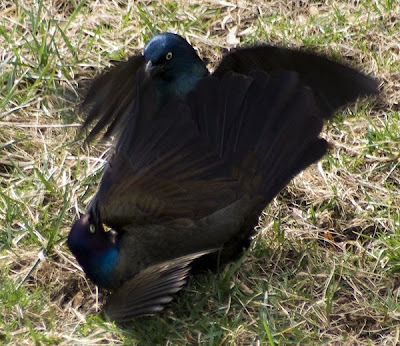 Grackles with their iridescence can be beautiful to look at - but my word, they are so LOUD sometimes! Love your banner - spotted salamander? Great shots! 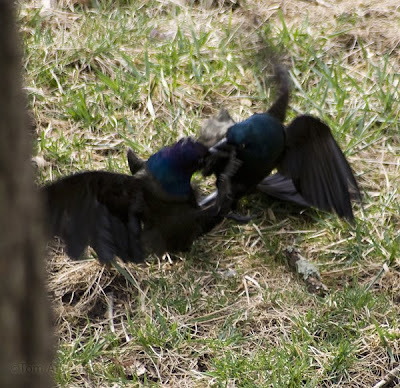 Bird fights are always lively to watch, but I've never been fortunate enough to have a camera at hand! Goodness, those are impressive action shots. We have lots of grackles but not in the amounts you are describing, not yet anyhow. I took photos of them at war with the starlings. They put on quite a show. 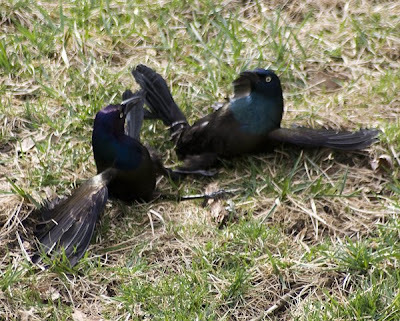 I have never seen grackles before, they look similar to crows, slight difference in colors. Great series of shots. Great action shots! They are sure loud, too! Wow, fantastic captures! I haven't seen any yet and usually there are a few that come here. I have never seen those birds! They look they are related to crows maybe? But I have seen blackbirds in early spring having such battles. Tom: Maybe that is your pay for feeding them. A complete fight on film, very nicely captured my friend. Yes, Tom, the grackles made their initial appearance here last week and now they are dominating the feeders and anything spilled on the ground. It usually lasts through their brood, coming to eat or be fed, and then they will disappear for another year. The grackles around here are big bluffers and will stretch their heads and neck straight up trying to be taller than the others. I have not seen any get into a scrap like you seemed to photograph. I've never seen them fight before! You got great shots! It's awful when a whole lot of any of the blackbirds show up all at once, but luckily they soon move on. It happens here 2-3 times a winter usually. Last year it was Grackles, this year it was cowbirds. Oh dear looks like they aren't very ahppy with each other, nice looking birds though. We have birds called Jackdaws which I think are very similar to your Grackle. They are always in my garden, but well behaved. Excellent series of images. The grackles are returning here too. About the only good thing about them is they scour the ground and eat up all the birdseed that spilled out of the feeders over the winter. Wow! They're nasty little things. They look like shadows in that series! Kind of like the movie "Jacob's Ladder." Great shots! You did a terrific job following the action of the fight. I love the 2nd fight shot!! I saw magpies fighting mid-flight which shocked and amazed me. They'd fly away from each other - approx 100m - then face each other and "charge" through the air until they'd wrestle in the air. I wis I had the video camera ready for that one. 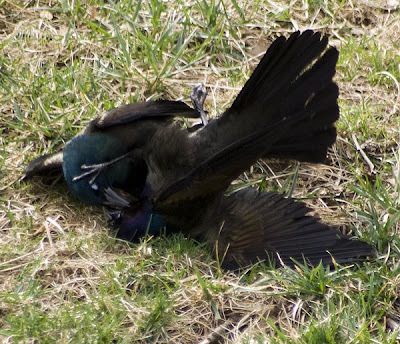 Grackle deathmatch! You could use photoshop to superimpose an octogon cage. That looks more like a cat fight! Ps. My mom is a OSU alum- she knows your area well. Bird fights! Gotta love it! That photo 5th from the top looks like someone has about ended the battle - that bird on the bottom looks about done! But, it apparently continues! Our Walmart has TONS of them, (I mean literally THOUSANDS), love the colors, not the birds-GREAT shots!! Those are some busy Grackles . . . I am rooting for the one on the right! One of the best examples of being in the right place at the right time with the right equipment (camera)! :) great pictures!!!! 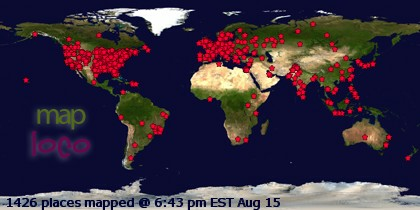 Thanks everyone for taking the time to comment and making this a great "camera critters" post! 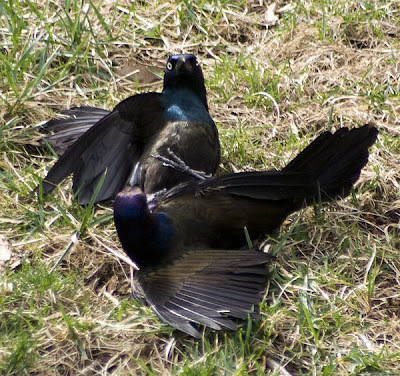 Although I didn't see it, my boyfriend observed two male cowbirds fighting in a small ditch at the research station in Toronto. The one male ended up drowning the other. Wow...that's quite the battle royale! I've seen woodpeckers, cardinals & doves go at each other, but certainly never for such an extended period of time! Thank you for the excellent pictures. 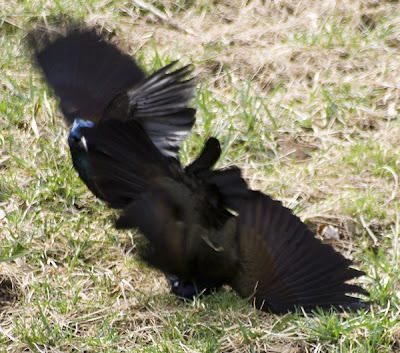 I found your blog after witnessing today here on the Eastern Shore of Maryland the same sort of grackle fight shown in your photos. We weren't sure of precisely what was happening. I slowly approached the seemingly entwined birds and they flew off, no doubt to continue their battle elsewhere. 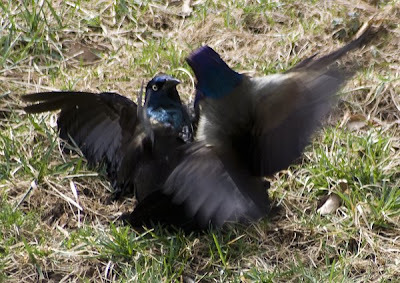 We saw two male grackles fighting viciously today on the ground (in Toronto), from a distance appearing like an injured bird flopping on the road. We approached to see if we could help, and then once we saw what it was about, broke up the fight by clapping our hands. They flew off in different directions, the one on the bottom nearly touched my head - I think he was saying thank you.